After over 35 years in Germany, a successful career, and a well-established dental clinic, Ziya Pir starts from scratch and will be running in the ranks of the HDP in the district of Diyarbakır – or Amed, as the Kurds prefer to call it. He is not Kurdish, but Turkish and with a very special family history. In the late seventies his uncle Kemal Pir, along with the more famous Abdullah Öcalan and other college students, founded the Kurdistan Workers' Party, better known as the PKK. Kemal Pir died in 1982 in a prison in Diyarbakır, following a unger strike he started with other militants. The elections of June 7th went well for you. Are pleased with your choices? I do not know, it's still all new to me. When I was first offered to run in the elections, four years ago, I said "no". And so did I last year too. It took six hours of uninterrupted conversation to make me change my mind, and an appeal to the memory of my uncle. I was doubtful, I know my last name is a factor here. People look at me, see my uncle, and expect the same things. But the truth is that there were many Kemal Pir – the fighter, the intellectual, the family man. Which one should I resemble? I can and want to just be myself, to put forward my ideas, which are those of the HDP. Though I spent many years in England and Germany, I am not foreign to the political life of this country. I know Erdoğan, for example, and he knows me. The AKP has done a great job in many ways, strengthening the economy and infrastructure, doing reforms that were needed. But in recent years people have begun to ask for something different, something that the AKP is unable to offer. Freedom of expression, individual and collective rights, environmentalism – immaterial thigs, but of great social impact. The HDP will be able to give a better answer to these new needs. Also the AKP began as a coalition, bringing together different groups that shared the same needs and giving them structure. So has done the HDP, which is home to groups with over twenty different backgrounds. Compared with the previous Kurdish party BDP, the electoral base is in my opinion much more moderate. In addition, there are many believers among us, including myself, but unlike others we do not make religion an instrument of political promotion. Freedom of faith cannot be questioned, but religion and politics need to be separated. We aimed to exceed the 10% threshold and enter parliament as a party for the first time in the history of the Turkish Republic: we succeeded. It would be wrong, however, to settle. This party should aim to get 20% of the votes at the next election. The HDP has had to fight against the skepticism of the Turkish electorate, also fuelled by the election campaign of the opponents. How did you convince the electorate that the HDP is no longer just a Kurdish party? The HDP must continue to improve in terms of communication, that was definitely the key to our success last June 7th. We were able to talk to conservative Kurds as well as liberal Turks, that we previously could not reach. We were also helped by the demographics: the young people who voted for the first time are closer to our ideas. I believe that the vote for the HDP can be divided into two groups. A vote of affirmation, which supports the party and its ideas, which I think is mostly Kurdish; and a vote of opposition, used to punish the wrong policies of the AKP, such as the presidential reform or Erdoğan's statements about Kobanî, which have alienated the Kurds who solidarise with that part of the world. I see the Kurdish vote for us as consolidated, unlike the Turkish vote, which is more volatile and could vanish should the polarising figure of Erdoğan and his ambitions end up in the background. To aspire to the 20% that I mentioned, we need to identify those voters who may consider the HDP palatable, but that we have not yet convinced. I refer to the Alevis, who constitute a large group, or those Kurds who chose to support Erdoğan's party. Those are the votes that we must earn to become stronger. What does the HDP have in mind for this country? Surely this country needs a new constitution, more inclusive of ethnic and religious minorities, with which everyone can identify. The struggle for individual freedom is another priority of the party. The right to protest, for example. People must be able to challenge the government without fear of retaliation and violence. From this point of view, Gezi Park was pivotal in strengthening public support around the right to freedom of expression. Personally, I feel strongly about ecology, a topic still neglected in Turkey – something you immediately notice coming from Germany. How do you respond to accusations that the HDP would be linked to the PKK, or even under its thumb? Many voters were driven away by this fear. The HDP was created in the framework of Turkish law. There is no link between the HDP and the PKK. Certainly our Kurdish electorate is symbolically and sentimentally attached to the organisation and to Öcalan in particular, and considers them part of their heritage and history. We cannot impose our voters a different view of recent political history. What we can do is to maintain and enhance our role of mediators in a political process aimed at offering a democratic solution to the problems affecting the Turkish state and society. Will the HDP act as a mediator to avoid a new phase of violence? If the issues that stemmed the armed struggle will be addressed and resolved within a shared, democratic framework, it is natural that the armed struggle will no longer have any reason to exist. I cannot ask the PKK to lay down the arms, but if we succeed in our programme, then the PKK will have exhausted its function and will no longer have reason to continue the fight. There are reasons why these people have taken up arms and live in the mountains. Certainly people have changed a lot in recent years. Let's look at the case of Ağrı: the government and the army, just before the elections and with the peace process under way, launched a military operation against the PKK for the sole purpose of endangering soldiers, fishing for someone to end up wounded or, worse, dead to create a case to be exploited in the elections. But people understood this and protected the soldiers, avoiding a bloodbath. It is our duty to protect soldiers from reckless abuse for provocation purposes. The same thing happened in Diyarbakır, with two bombs exploded during the rally two days before the election. That day I was on stage, intimidated because my speech spoke of brotherhood between Turks and Kurds, and I did not know what reaction to expect from a traditionally very nationalist audience. Yet, their cheers and chants of support made me realise that people here really want peace. Here, the HDP must commit to get this desire for peace through to the west of the country. I was the first to speak, but out of eleven speakers only five managed to speak before the bombs blew up – the first, then the second, and many of us expected a third, under the stage. Then, through smoke and screams, the police deployed about fifty agents in riot gear, who tried to clear the square. There were thousands of people, high tension, a crowd shaken by panic and anger – what was the point of sending fifty agents in such a context? They were only sacrificial victims, sent in the hope that the situation would degenerate and they would be lynched. Exactly like in Ağrı. Yet, even in this case, despite four dead people and hundreds of injured, people once again proved they were looking for peace. After the elections, tension has increased between supporters of HDP and of Huda Par, an ultraconservative formation known as the Kurdish Hizbullah. In Diyarbakır there have been clashes and deaths. Is this split within Kurdish society bound to expand? Will there be more violence? I believe this episode should be read within the government's strategy of tension. Huda Par is a small group with minimum support and, like some ISIS militants, are only tools of the government, which is the real architect of these machinations. It is an established fact that the Erdoğan government has close links with Islamic fanaticism and extremist groups engaged in Syria. Now some Huda Par supporters threatened to eliminate some HDP Mps – I have stopped using public transport myself, which is not what I was hoping for when I came here from Germany. Now that you have cashed in on your electoral results, it is coalition time, the topic the entire country and the international scene are holding their breaths about. 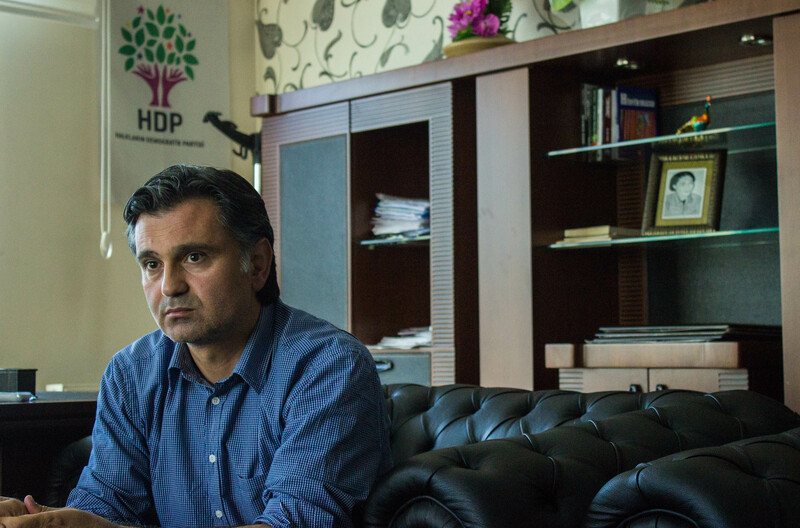 What future for the HDP? We will be at the opposition. For sure there will be no coalition with the AKP. In the past we have worked with them on the issue of the Turkish-Kurdish peace process, but a coalition would have negative political implications, because the AKP could win back those Kurdish votes that we took. For us, a CHP-AKP government is at this moment the best solution – it would allow us to support external initiatives that are compatible with our political manifesto, while at the same time we would be free to make tough opposition when necessary. We are not stepping back from the Kurdish-Turkish peace process, which remains on top of our political agenda. The worst case scenario would be a government of AKP alone. It is true that according to the results of the elections that is not possible, but the AKP is missing only 18 seats to make it happen. I fear that in the coming months will see a relentless courtship in this sense. Öcalan has been in prison since 1999. Now that you are in parliament, will you try to obtain his release? No, Öcalan himself has personally stated that this is not the plan. Neither it is for the HDP. What is most important that he can continue to write and speak to his people.